The Aroma Magic Hair Oil is a unique blend of essential oils of argan and bhringraj, this oil helps improve hair quality and reduce split ends. 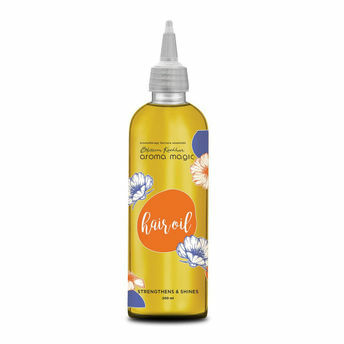 The essential oils of hibiscus and lavender help maintain the natural sheen of your hair, nourishing both the hair and scalp as well as fortifying the hair follicles. The extracts of thyme and pomegranate formulation strengthen the roots of your hair and improve its growth, giving you soft and smooth hair.